Aivoterveydeksi! is a health & education based mobile app built for iOS, and it's available on iPhones, iPods and iPads running iOS 7.0 and later. The app provides information and training around maintaining healthy brain activity and how memory functions, as well as information regarding memory disease and how it affects diagnosed individuals. It also contains several games, a calendar and personal activity tracking system, a blog, a personal risk test and many other subtle features. The app is targeted towards people of all ages, as it provides a wealth of information about memory and the brain, and how certain activities and behaviours can help increase the health of your brain. The society was established in 1988 to provide help and assistance for people with Alzheimer's disease and their caregivers. 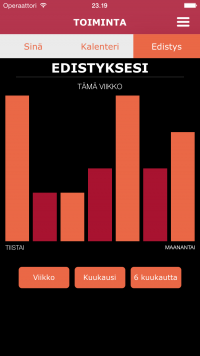 The society is a non-profit organisation and it is mainly funded by the Finnish Slot Machine Association. Aivoterveys - Brain health: a content section full of essential articles related to healthy brain activity. 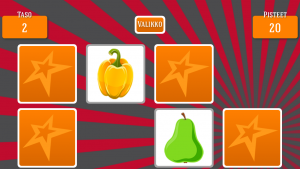 Pelit - Stimulating games (Sudoku, Memory, Colour match). 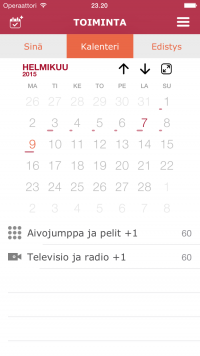 Toiminta - Activity section, calendar and progress. 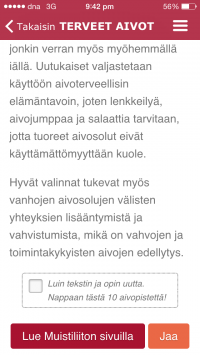 Blogi - The Muistiliitto blog. Info - Information about the organisation and the app. The brain health section of the app is a collection of information relating to memory diseases and the steps necessary to maintaining healthy brain activity. 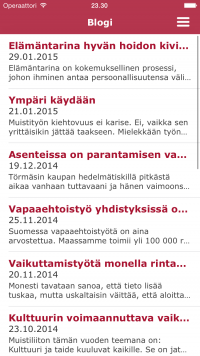 Many of the articles in this section have related counterparts on the Muistiliitto website that they link to. Users of the app can share articles that they find interesting to Facebook, as well as being able to track what articles they've read by activating a checkbox on each page. 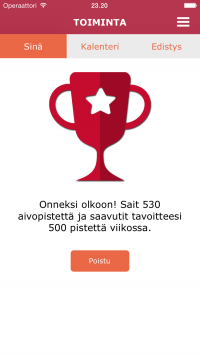 By selecting the checkbox, the user is awarded "brain points", which are collected and displayed in the Activity (Toiminta) section. Colour Match: Fight against your brain's automatic response to conjure the name of the colour written, rather than the colour of the text. Memory: Flip cards to find matches; remember where you saw that pesky apple! Sudoku: A classic game that appeals to all ages. Colour Match is designed to make the user concentrate on the appearance aspect of the "colour text" without processing what the text means. By concentrating on just the colour and not the meaning, the user has to overcome the natural habits of the brain in order to succeed at the game. The Memory game is an incarnation of the classic card-flipping memory game where the user must find matches to complete each level. The levels get progressively more difficult with more cards added each time. Memory encourages the user to engage with their memory to recall where they saw certain cards. Sudoku is a regular clone of the game, with the typical 9x9 grid - The game supports both numbers and colours for game pieces. The activity section provides the user with an interface to monitor their progress and brain points. Brain points are awarded to users when they complete some form of activity (reading, playing a game, recording personal activities such as exercise etc.). The points are stored permanently, but shown as a weekly score on the main page in this section - "You". Users are encouraged to reach the point-goal each week, and their progress towards it is shown on this page. The next page in this section is the calendar, which allows users to see their activity on a day-by-day and month-by-month display. Each day can be selected to bring up a timeline of the closest activities performed around that date. Users can also add records of their activities straight to this page, which allows them to keep track of activities (which are relevant to brain health) they take part in outside of the app. The last page is the progress page, which presents a graph that shows the points scored over a period: 1 week, 1 month or 6 months. 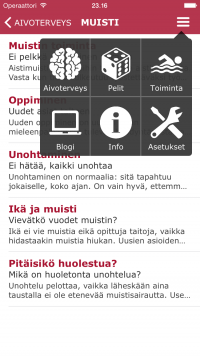 The blog is a news feed directly from the Muistiliitto website, so users can keep track of updates and news in-app. It also provides a great way for users of the app to share blog posts with others. The list of blog posts is updated in the background whenever the app is opened, and a notification is shown to the user when new posts become available. 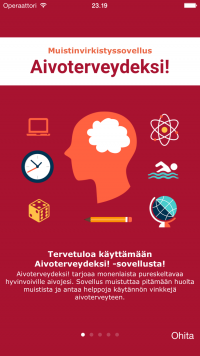 The information section contains content describing Muistiliitto and company practices, as well as some entry-level information for people concerned with memory diseases. There is also an information section regarding the application itself, why it was developed and how to use it. The settings page provides a simple interface that allows users to clear in-app data. I developed the application over a span of about 10 months, starting in March 2014. The app was released in the app store on March 10th, 2015. The application was custom built for Muistiliitto, with only a small amount of functionality dependent on open-source projects. You can download Aivoterveydeksi! from the iOS app store.